"A Preview is simply the next best thing to being in the field yourself." A preview is an independent verification of equipment by a third-party. When you use ironmarket, we send our independent agents to take photos, videos and verify equipment details. Then you can use our platform of services to buy, sell and manage your equipment or have someone do it for you. With ironmarket you are in control. 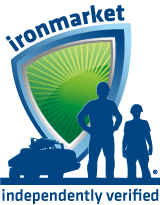 The ironmarket shield is a symbol of trust bridging buyers and sellers. You can be confident that any piece of equipment which displays the shield has been verified by one of our independent third party agents. All agents are trained in the methodology of collecting equipment specific information. A preview doesn't classify equipment as good or bad. At ironmarket we remain unbiased and objective in our observation of equipment assets. We capture the data, the photos and videos and you get to make the decision. Look for the shield the next time you want to buy or sell equipment assets. Preview agents operate on ironmarket's business network allowing participants to access their equipment information online anywhere the web is available. Data collected is typically available to be reviewed within twenty-four (24) hours, providing consumers with an efficient manner of accessing and sharing specific equipment information. If you have specific equipment assets that you would like previewed, enter your name, email, and a brief description of the assets to be previewed. One of our agents will contact you immediately. Join Ironmarket. Your agent may send you an invite to join the network or you can sign up yourself. Login to ironmarket.com, using your email and password created. Click on the "Equipment" tab located in the top right corner. Click on "Request a Preview Quote". Postal code where the equipment is located. Quantity of equipment assets to preview. Click on "Submit Request". Your request is then sent to Ironmarket for review and processing. Receive, Review and Accept or Decline your Preview Quote. Once you have Accepted, your project will be forwarded to the closest field agent to your location. The field agent will contact you to validate your quote request information entered and to schedule a time to complete the preview(s). Once completed your previews will appear under the "Manage Preview" link in the "Equipment" tab of your Ironmarket login. You can now share the preview information including photos and videos with anyone. You can email links to a public view of your previews. The other party doesn't have to login to Ironmarket to view. You can push your information to a Sealed Bid Offering and get bids on what people would pay for your equipment. An Preview not only gives you the ability to make the right buying decision but is also an excellent marketing tool. Our skill and knowledge of the equipment industry will make your buying, lending or insuring decision easier, more informed and more profitable. We specialize in conducting professional equipment asset previews. Showcase equipment assets like never before, by utilizing the web and increasing the equipment's exposure. Ask yourself if you were in the market to buy or sell would you have more or less confidence in your purchasing decision by reviewing assets that have been verified by a 3rd party unbiased, independent agent? Before making your next buying, selling, lending, or insuring decision, insist on a Preview providing you with a complete, validated, unbiased, detailed description of the equipment asset. Ten (10) additional relevant questions and answers published exclusively pertaining to the equipment. Thirty (30) additional relevant questions and answers published exclusively pertaining to the equipment. Fifty (50) additional relevant questions and answers published exclusively pertaining to the equipment. Photos Up to ten (10). Up to twenty (20). Up to fifty (50). Up to one hundred (100). Up to one hundred (100). Videos N/A N/A One (1) video. Up to three (3) videos. Up to three (3) videos. Number of Questions Asked N/A Up to ten (10). Up to thirty (30). Up to fifty (50). Up to fifty (50).